Human Axl, His Tag (AXL-H5226) is expressed from human 293 cells (HEK293). It contains AA Ala 26 - Pro 449 (Accession # AAH32229). The protein has a calculated MW of 46.6 kDa. 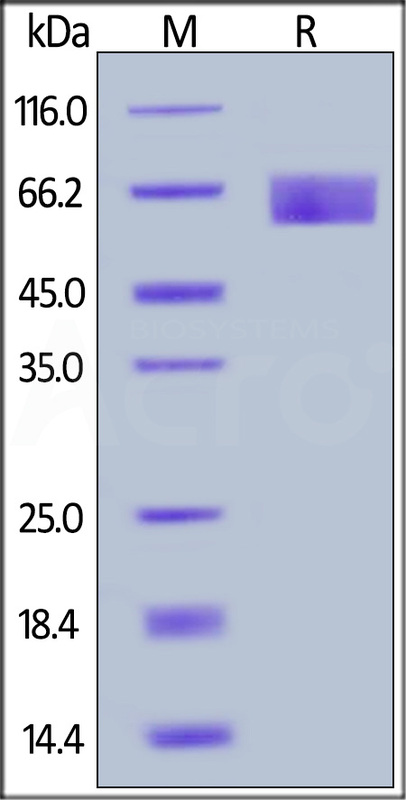 The protein migrates as 60-70 kDa under reducing (R) condition (SDS-PAGE) due to glycosylation. Human Axl, His Tag on SDS-PAGE under reducing (R) condition. The gel was stained overnight with Coomassie Blue. The purity of the protein is greater than 95%. Authors: Goldstein N, et al. AXL Receptor Tyrosine Kinase is also known as Tyrosine-protein kinase receptor UFO, which belongs to the protein kinase superfamily, Tyr protein kinase family and AXL/UFO subfamily. AXL contains two fibronectin type-III domains, two Ig-like C2-type (immunoglobulin-like) domains and one protein kinase domain. AXL is highly expressed in metastatic colon tumors. AXL is activated by GAS6-binding and subsequent autophosphorylation. AXL is involved in signal transduction from the extracellular matrix into the cytoplasm by binding growth factors, and thus implicated in the stimulation of cell proliferation. (1) Varnum B.C., et al., 1995, Nature 373:623-626. (2) Gallicchio M., et al., 2005, Blood 105:1970-1976. (3) Park I.K., et al., 2009, Blood 113:2470-2477.